I simply do not track vocals without the LA-2A. It's simple and efficient, adds that inexplainable 'glue' element to whatever you throw at it. I cannot think of a better vocal chain than a U47 running through a Ruper Neve designed preamp into the LA-2A before the signal hits the converters. We recorded all vocals on our latest album this way: the record went platinum, won Best Rock Album in Hungary and gets a lot of airplay. That's the way, aha-aha, I like it. While the LA2A doesn't work for everyone, when it does it is killer. This is by far my favorite compressor I own. Transparently Awesome! Just get it! The LA2A is plain magic. Just try to compress a voiceover with a low male voice, and compare the hardware vs. any software modelling solution. You'll see... Same goes to electric bass... And if anybody tells yoou that optos are not for drums, try it on bassdrum just once, and the judge on your own! I'll say it a million times. It ain't the same without the LA2A! 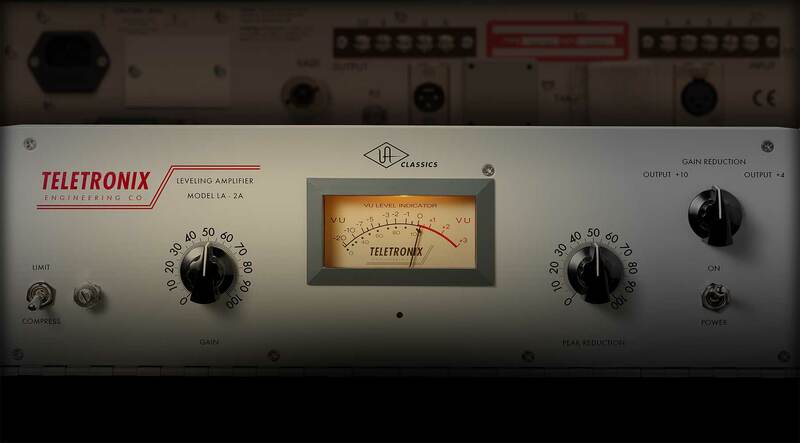 This vintage limiter/compressor is by far the best around. The way way the vocals. Sound so warm and the way they melt on a record is Extra ordinary, I run my neaumann mic thru my Avalon 737 to he LA2a and the results are very impressive . I don't think I could ever record anything with out it. I adds that extra element to every recording it's a must buy if you want that radio sound and clarity . I can't imagine recording a voice without that compressor. I used it with a preamp neve 1272 and a sony c800g microphone...what else ?! I have used this compressor in many studios and in all kinds of stiles all over the years, but only now I had the chance to by one of my own an I have no words to describe how happy I am. Ive only ever used one hardware LA2A in my life, that is the new RI i bought last week. The sound is amazingly lush and rich, the distortion on some sources just makes you melt. The new LA2A plugin pack is fabulous, but as they say; close but no cigar. I love this compressor, its beautifully made also and feels like a tank. I use it for guitars mainly, but also some percussion, pretty much everything i send it comes back better. Another classic product from UA. I use this in conjunction with my 1176 and have no need for an EQ as this does everything I need it to. Great at warming up harsh vocals and getting that saturated tone. It took some getting used to, as I would often use with vocals on the way in. In my opinion it's too soft for rap vocals but incredilbe everywhere else.